Compass Health & Safety Ltd. is determined to ensure all companies get the opportunity to benefit from the safety perception survey process – not just the few companies that can afford to pay for expensive survey consultants. Compass is commtted to making the approach available and affordable to every company. We aim to guide every one of our clients through the survey process so that their surveys succeed in revealing information that prevents them from achieving world class safety. We have experienced first hand the power of safety perception surveys. Twenty years ago while managing a health and safety program for a large untility, we witnessed incredible cultural and statistical improvements that could only be accredited to listening to what employees were saying and then acting to resolve their issues. This company went from a utility with one of the worst lost time accident performances in the country to the best within two years. From this success and many others, we felt compelled to spread the word about safety perception surveys. Over the last ten years we have worked hard to develop a survey process and web-based survey application to help safety associations, union groups, conglomerates, safety consultants and small, medium and large companies harness the power of the safety perception survey process. To make the process affordable we developed a do-it-yourself approach. We wrote a book explaining the process. We developed four different survey databases. Finally we have a database that has the power to serve the needs of all of our customers. It is powerfull, flexible and effective. Now we want to share our survey process with you. We need to look at doing something different because current approaches are not improving our health and safety. Fatality rates are flat to rising and using incident statistics to determine our way forward to improvement is like driving while looking in the rear view mirror. Many system audit processes have not kept up with what it really takes to achieve excellent safety performance. Many auditors are under trained and under qualified to properly assess safety performance (more on this in our articles section under What’s New – Articles –“Are you suffering from Audit Fatigue“. Audit questions are primarily derrived from material proposed 86 years ago by W. H. Hienrich and do little to assess what current research says really promotes health and safety success. The information below touches on this subject in more detail but if you want to read some more on our view of the current system audit process refer to our article under What’s New – Articles “Yes, there is a cure for Audit Fatigue and Audit Paralysis”. Safety perception surveys are offered by some very large well know companies involved in survey consulting. They draw their approaches from people like Dan Petersen who pioneered safety perception work in the 80’s. At the time the work was ground breaking. However, there have been many safety determinants that are not or have not been incorporated into the surveys they offer. Compass has incorporated new research into their master question list such as on “worklife balance and job satisfaction and job security”. Your survey can incorporate the most recent research into health and safety management as it is not linked to reseach that was conduct 30 or more years ago. Audit fatigue is a condition or state that a company reaches when they have repeatedly used safety audits to assess their health and safety management system. Year after year they have used the same audit instrument and asked employees the same questions and with each passing year they obtain less benefit from this repetitive process. 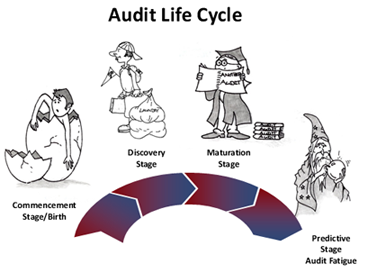 The Audit Life Cycle starts with the Commencement Stage (see figure below) when a company decides to first audit to see where they stand relative to the audit protocol requirements. As time progresses, they mature and some time after that they reach the Predictive Stage where they can predict the outcome of subsequent audits. At this stage, companies find audits offer no new insights. When companies get to this stage in their audit life cycle, it is time to look at alternative assessments or assessment approaches. If your company has ‘audit fatigue‘ it may be time to try a different measurement approach such as a safety perception survey. Contempory audit protocols focus on measuring compliance to legislation (e.g. first aid, reporting, fire safety, safety committee meetings, etc.) and on basic health and safety program elements (e.g. inspection, investigation, risk assessment, etc.). Many of the audit protocol questions have been derived from the basic safety elements that were advocated by W. H. Heinrich over 85 years ago. We have come a long way in safety excellence research since Heinrich’s time back in 1931. Current research indicates there are many other factors (e.g. cultural factors) that have a profound influence on health and safety program success. Compass has an 9 step do-it-yourself safety perception survey approach (see figure below) that helps companies identify key employee perceptions that could be preventing them from continuing to improve. Compass also has a master question list of over 150 survey questions. Many of these questions incorporate current safety excellence research. Our survey system is exceptionally flexible. For example, you can use an off-the-shelf survey and add or subtract as many questions as you want. You can choose to include the findings of the additonal questions or toggle them out depending on need. Although Compass has surveys that you can just pull off the shelf and use, we encourage companies to develop their own company specific survey. We believe that each company is unique in its’ survey needs. If you have a fleet, you should include fleet safety related questions in you your survey. If you have contractors, you may want to include questions to help assess contractor safety management. 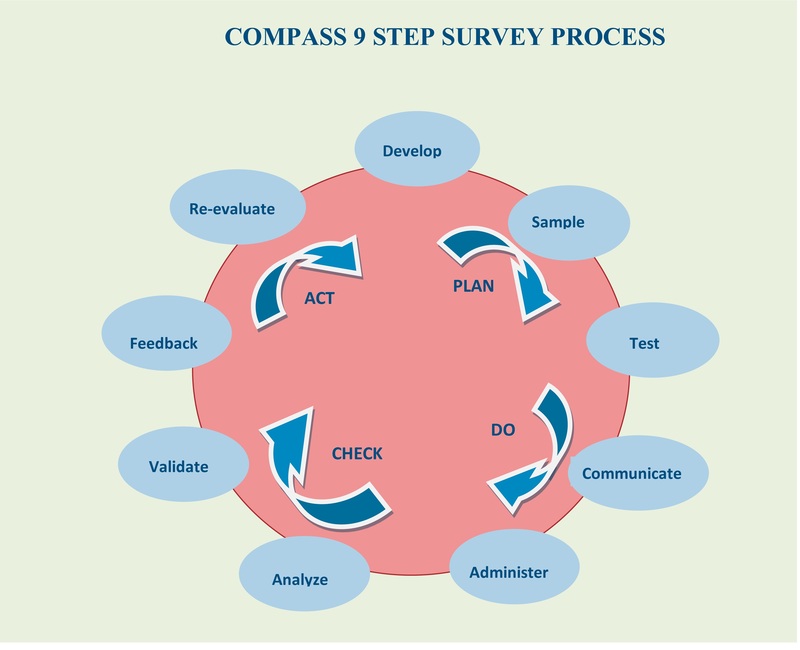 Compass will guide you through the 9 step do-it-yourself process to ensure your survey meets your needs and succeeds. A Safety Perception Survey will help you understand why, your company has not achieved safety excellence. To achieve safety excellence you need to know whether your employees are faced with social or organizational pressures that influence them to work unsafely. You need to know if , their performance is being affected by psychological factors such as a poor work-life balance. You need to know if employees believe management can be trusted and are considered to be credible. And of course, you need to know how employees perceive the effectiveness of standard safety elements such as training, reporting and investigation, etc. We can help you create and/or incorporate appropriate questions in your survey to get answers to these questions. All survey consulting companies claim to have the definitive model that outlines the elements that lead to health and safety success. Compass is no exception (see below) but we will not claim that our model is the definitive model for your company – that’s because all companies are different. Our model offers key determinants to health and safety success that should be considered when developing an assessment survey. This is an interesting question. There are few ways of validating questions. Our believe is similar to the late reknown father of safety perception surveys, Dr. Dan Petersen who said, “A validated question is one that works.” There are formulas that can be applied to validate survey questions. The question is, is it valid to apply the results of questions of one survey of one company to that of other companies that may be significantly different? We have a database of over 150 safety related questions in our database that have been used by many companies. For some companies the questions had to be modified slightly in order for it to work for that specific company. Part of the validation process is to TEST your survey before use. Testing is part of the Compass 9 step survey process and it is and excellent way to ensure there are no surprises after you have administered your survey. Ultimately, your survey needs to solicit the information that you want/need to know. Employees feel comfortable bringing up work site health and safety issues? Are production or service quotas valued over safety? Do supervisors have the authority, or use their authority to stop the work to prevent employee injury? Do you feel you have a good balance between your home and work life? Do employees feel they have been given adequate training to safely carry out the work safely? Health and safety risks are NOT overlooked in order to get the work done. Is management actively involved in the health and safety program? Are employee safety values, attitudes, etc. closely aligned with those of management? What distinguishes Compass from other survey competitors? Safety management system assessments do not need to be an expensive process. Take management system auditing for example, auditors are hired to painstakingly interview employees. They interpret the interview information, filter it to some extent, and provide a view of what employees are saying often based on a YES or NO response scale. Essentially with each interview the auditor must determine if the interviewee response should be recorded as 100% positive or 0% negative. Of course, we all know that many interviewees responds are somewhere between these two broad scoring goal posts which puts the validity and certainly the accuracy of the interview process in question. Each interview is 30 to 60 minutes in duration. The final result is an expensive ball park assessment of employee perceptions. Some safety perception surveys are conducted by interview. We believe the best way to solicit employee information is to ask the employees directly and allow them to score their response on a scale that more accurately reflects their perceptions. This is a cost effective approach and can reduce the assessment process by one third to one half because the information is collected electronically. The information is more accurate because it is collected on a 1 – 5 scale versus a 1-2 scale. Most safety perception survey consulting companies do not offer a do-it-yourself survey option. Many of those that do leave you to flounder on your own through the process. We guide you. The alternative to a do-it-yourself approach is to hire an external consultant. Compass has written the book on how to conduct safety perception surveys. We have developed a two day how to course on the process. We have developed a comprehensive survey database along with a user’s manual. Our database is distinguished in the bullets below. This is expensive and the cost is prohibitive to most companies. The key reason safety perception surveys have not gained widespread use, is that most companies simply cannot afford the expensive consultants. A Compass survey differs from many survey providers in that our surveys solicit employees to not only score the questions but also add comments. In the absence of employee comments, other survey providers have to later set up focus groups in order to try determine to understand the employee scores. This is generally a very time consuming and expensive process. Our process minimizes and often eliminates the need for focus groups. The Compass survey database allows for bench marking with others. This is a very important benefit as it allows you to see how your organizations stacks up against others question by question. If your survey contains questions that have been used by other companies your results can be compared with them. This an important feature that many other survey providers cannot provide. Many consultants have basic database programs that are not easily accessed because they are not web-based and require hardcopy administration of the surveys which is very labor intensive and costly. Our powerful web-based software can be accessed by any registered user, anywhere, anytime. We help you develop a survey that is right for your organization. Yes we have surveys that we can pull off the shelf but we believe each user has unique needs and each user differs in their stage of health and safety development. Where one company should employ questions that are more traditional, another company may be prepared to ask questions that are more cultural. We have over 150 questions in our master question list that clients can use or we can help develop questions that meet your organization’s needs. Additional questions can be added to surveys from other sources or other disciplines such as human resources and environment. It is feasible to conduct your own safety perception survey. External consultants need to spend a great deal of time onsite just to get a sense of how your organization works. This is an expensive orientation to your company. Consultants also have to spend a great deal of time with your organization post survey holding meetings with employees to find out what our database finds out at the time of survey administration through respondent comments. Without the knowledge gained from these processes it is not possible for them to offer recommendations based on the data they gather. We maintain that internal resources are better equipped to conduct a surevy and can do so at significantly lower cost. Our 9-step survey process will guide you through the survey process from start to finish. If additional help is needed we are there to help our clients. We want your survey experience to be cost effective and succeed in identifying opportunities for improvement. When you conduct a survey you do not want to leave employees out because just because they do not have a strong command of English. In fact, their lack of understanding is even more of a reason you may want them to complete the survey. With the click of a button our survey can be changed to over 100 different languages. Toggle survey questions in or out of the final report. This is a feature that large organizations and associations would be interested in using. Typically one standard survey is developed by these organizations for each of their clients to administer. But as previously stated, some companies have very specific survey needs. For example, one company may have the need to assess contractor safety or fleet safety and others may not. Our survey applications allows an association to administrater a standard association survey but also allows the individual company to add company specific questions that will or will not be accounted for in the survey totals. This ability is great for companies that are participating in programs that have standard survey needs as it allows them to raise the bar by adding additional questions. We believe that no company should be held back by others that have health and safety programs functioning at more basic levels. The database offers a standard deviation report that is key in data analysis. There is the ability to create charts (pie charts) depicting positive, negative and neutral comments by percent. Our surveys offer respondents the opportunity to provide additional comments that perhaps do not relate to the questions asked in the survey. For example, “Is there anything else this company needs to do to improve in safety.” This report often contains many important issues that should be acted on. Our Demo offers a taste of the types of reports you can print off. They can all be exported to Word or Excel or PDF. If you need to hide some data because you received too few response in any particular area, it is easily done because we have built in this functionality into our database. If people are really our most valuable resource, why do some companies spend so much time not asking employees them what they think? To be effective, management needs to know what is happening inside the hearts and minds of their employees. Unlike an audit, a safety perception survey focuses not on what is documented and stated is in place but on is it all working. Compass believes (and this is supported by studies) that the safety “hardware” (e.g. investigation, inspection, orientation, etc.) accounts for only a part of the health and safety excellence puzzle. It’s the “software” – cultural or human psychological factors such as trust, credibility, leadership, satisfaction, autonomy, etc. that accounts for the rest. These soft factors influence whether or not a company will ever have success with the hardware. Safety excellence has eluded many companies simply because these softer factors have never been measured and addressed. The answers to your survey will not only provide you with insight into what needs to be done to improve safety but often will also reveal issues relative to productivity, service and quality. For example, if workers are not following safe work procedures, they are very likely not follow operating procedures. Visit our Products section to learn more. Our Products section provides a summary of our safety perception survey process and more detail on the database reports. If you are a large organization such as a union, safety association, conglomerate, safety consulting group, take a look at our special offer of reduced rates and a free survey.